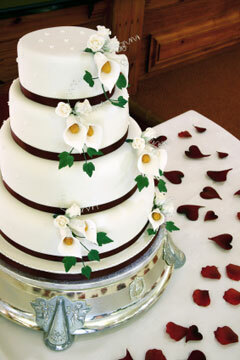 There's something gorgeous and elegant about black and white wedding cakes that brings an air of sophistication to a wedding. The groom's black tuxedo and the bride's white bridal gown conjure up the scene of the ultimate black and white ball! Black and white cakes are a natural progression in keeping with the theme. This classy colour contrast is still appropriate for a semi-formal wedding, but for the formal wedding, it fits like a glass slipper! 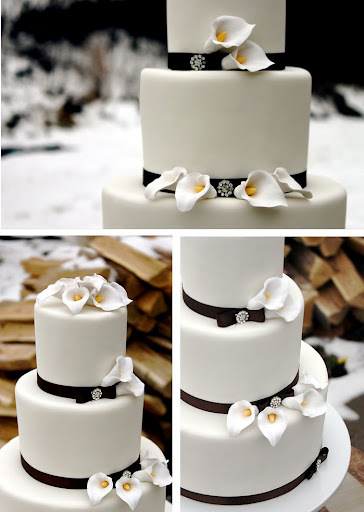 Here are some black and white wedding cakes with calla lilies.